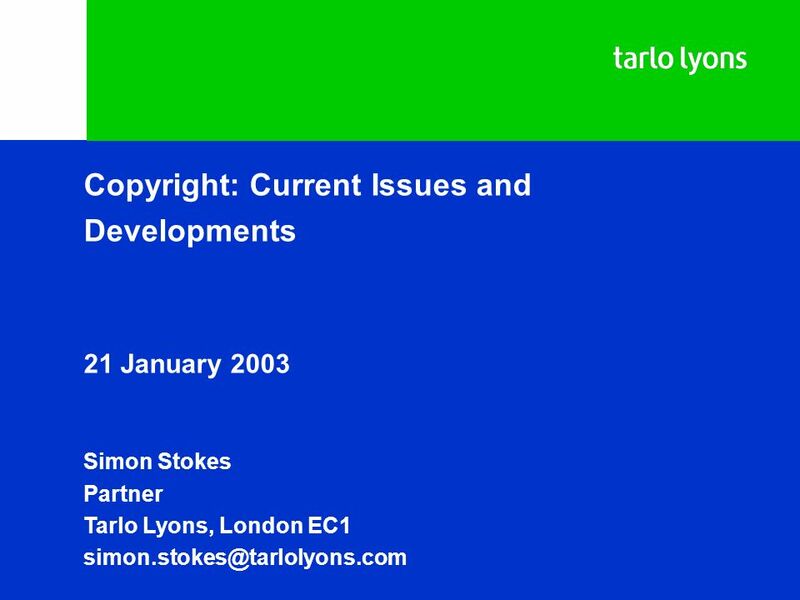 Download ppt "Copyright: Current Issues and Developments 21 January 2003 Simon Stokes Partner Tarlo Lyons, London EC1"
Selected Copyright and Related Rights (IPRs) Issues. The Interfaces Between IPRs and PSI Re-Use (or Open Data). Dr. Cristiana Sappa Project Manager of. 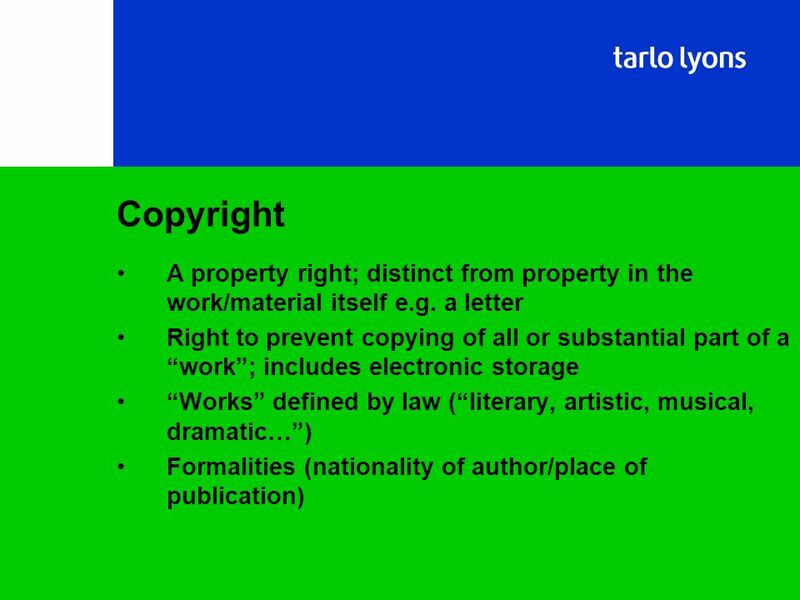 Selected Copyright and Related Rights (IPRs) Issues. The Interfaces Between IPRs and PSI Re-Use (or Open Data?). Cristiana Sappa Project Manager, LAPSI. Intellectual Property and the Ownership of Research 6 June 2007 Professor Fiona Macmillan. Data copyright, rights management and the use of existing data resources Managing research data well workshop London, 30 June 2009 Manchester, 1 July 2009. Intellectual Property, Science and Databases Dr Charlotte Waelde Co-director, AHRB Research Centre for Studies in Intellectual Property and Technology. 1 Look-here! Project Meeting: Copyright Introduction to Intellectual Property Rights Bernard Horrocks © Naomi Korn Copyright Consultancy 2010. Data Analytics – A Policy Perspective Benjamin White, Head of Intellectual Property British Library. 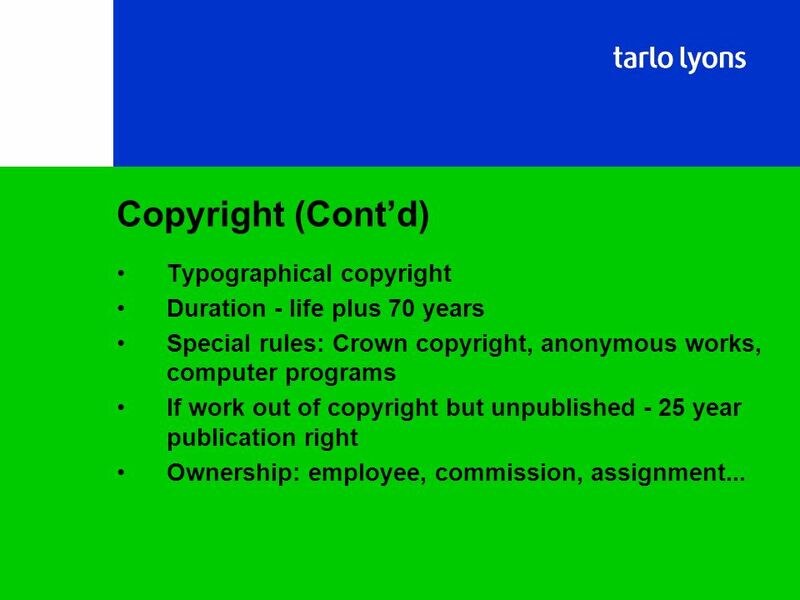 Protection of expression of ideas Generally life of creator plus 70 years No register in the UK © symbol What is Copyright? E-commerce Law Intellectual Property and e- commerce 2. Introduction to IP Presentation to BASME 15 October 2014 Niall Head-Rapson McDaniel & Co. Copyright and Moodle Tony Simmonds Information Services June 2012. 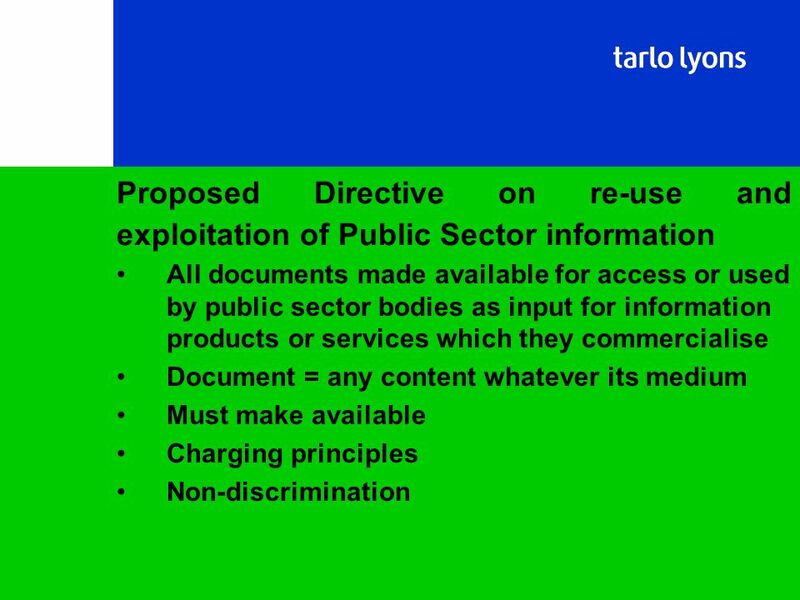 Information Services and Systems Getting Published… copyright considerations Caroline Rauter This work is licensed under the Creative. 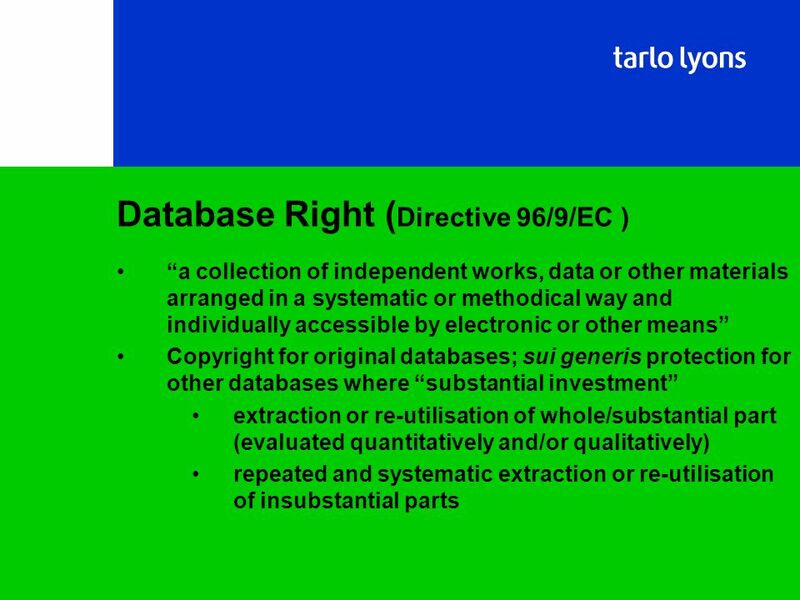 Vivien Irish, Patent Attorney, WIPO and TPI, January 2005 Copyright and related issues for SMEs Vivien Irish Consultant Patent Attorney. The Health and safety Act, is an act to make further provision for securing the health and safety and welfare of persons at work.For protecting others. 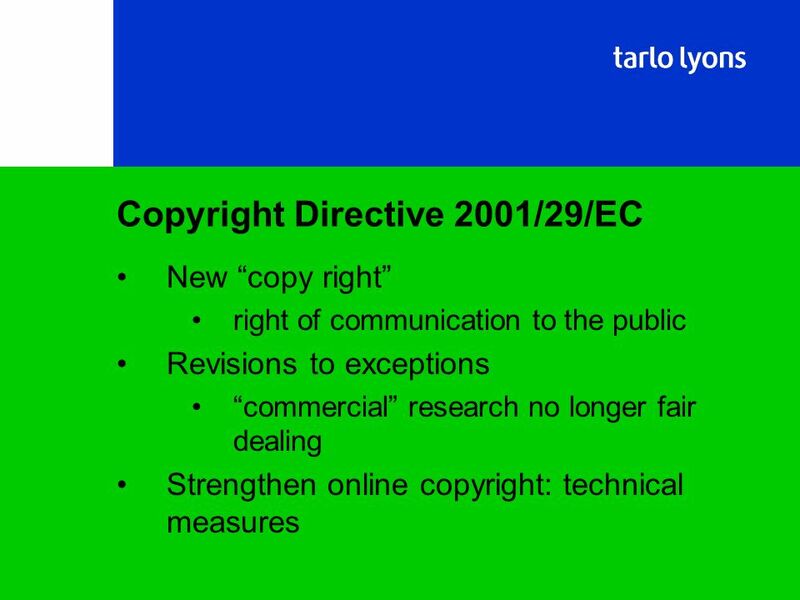 Www.ip4inno.eu ip4inno Module 2A Unregistered IP - Part 1 Introduction and Copyright Name of speakerVenue & date.